The World Press Photo Exhibit is an internationally renowned collection of award-winning images that is being shown in over 100 cities in 45 countries. Austria, Japan, Israel and many more are participating in showcasing the work of visual journalists worldwide, and on October 3rd Torontonians can view the exhibition at Brookfield Place for free and appreciate the deeply compelling, and sometimes disturbing, images on display. Newmindspace Toronto is promising that the evening of October 7th will be lit up with a massive glowing sword battle at Nathan Phillips Square. If you don’t have your own light saber for the “glow battle,” don’t fret – glowing swords can be reserved online for $10. This year’s battle may be absent of some of the usual Jedis and Siths due to a Star Wars-related intellectual property lawsuit, but the event promises to be just as action-packed and colourful as every year. Guaranteeing “roaring fires, amazing food, and tasty drinks,” Evergreen’s Feast On Barbecue is designed to bring back the cottage vibes of the summer. Tickets are $150, and attendees can look forward to all-you-can-eat local dishes, unlimited drinks, axe throwing, beard trimming, airbrush tattoos, live music, a silent auction, and more. Don’t miss dessert – authentic Canadian-style butter tarts are guaranteed to give cottage season the send-off it deserves. October is the spookiest month of all, and the Toronto After Dark Film Festival is one of the world’s leading showcases for new horror, sci-fi, action and cult movies. In its 12th year, the festival will be held at the Scotiabank Theatre and screen fifty new feature films and shorts over a nine-night span. There will be Q&As with filmmakers as well as a Zombie Themed Night and “Pub After Dark,” the nightly after-screening social event. Of course the world’s largest poutine-eating competition can be found only in Toronto, but Smoke’s Poutineries’ annual event is also the second largest professional eating competition in the world. The event features three individual eating competitions: Amateur, Professional, and the Charity Challenge. Last year, Joey “Jaws” Chestnut took home first prize for eating 25.5 pounds of poutine in 10 minutes! The Bata Shoe Museum is undoubtedly one of the city’s most unique attractions, hosting various events and film screenings dedicated to all things shoes. This October, they will be hosting “a special screening of the digital short 40 Years of Goth Shoes which celebrates the fantastical shoes and boots worn by women in the Gothic subculture. Cask ale is unfiltered, unpasteurized and naturally carbonated. Once tapped, it only has a few days before going stale, so time is of the essence when enjoying this particular brew. On the third weekend of every October, Cask Days fills up the Evergreen Brickworks with as many cask-conditioned ales as possible for the public to sample. 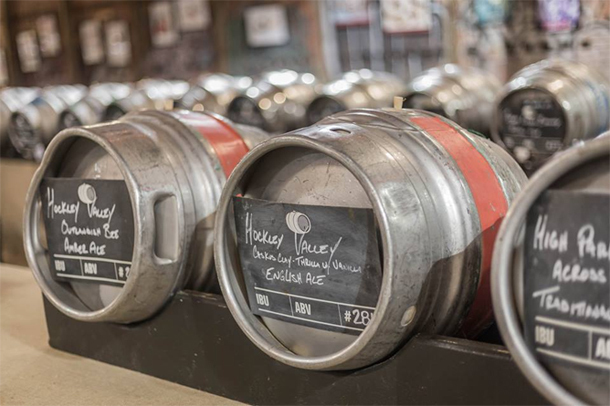 There will also be a cask supply shop and “Cask Ale Trail;” a map of where to find cask-conditioned ale in Ontario year-round. The Vintage Art Crawl happens twice annually in the city, and aims to create a fun and party-like shopping atmosphere that lasts well into the night. The event is great because it helps local residents better get to know the businesses and artists in their communities, and takes place in multiple neighborhoods across the city.